﻿Calendars are independently published by BROWN-ROSS Publishings. All rights reserved. Thank you for your support. 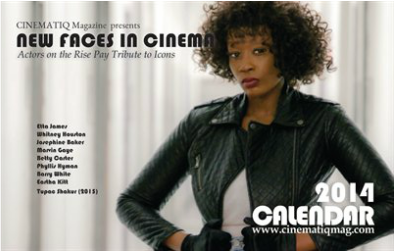 In honor of Black History all year around CINEMATIQ™ magazine creates memorable collection of calendars featuring emerging and established working Black talent in the film, television and overall entertainment business. The calendars reflects what is happening in the industry of the time. If you would like to participate, hagtag #CinematiqMagazineCalendar or visit www.cinematiqmag.com and click on contact. Click on the images above to read about each calendar project and purchase copies of the latest one! All copies will be mailed to your home or office. Product are independently published by BROWN-ROSS Publishings and printed in the United States. (C) 2010-2016 CINEMATIQ™ Magazine. All rights reserved.